Below is a selection of our most recent synthetic turfing projects. You can see the lengths that we go to in order to ensure your new artificial lawn is weed free, flat and perfect. 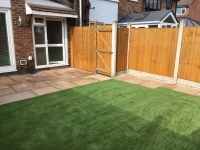 Once we complete your new artificial lawn you will have a pristine astroturfed lawn that you can be proud of. The finish looks so good that one of our clients will not walk on it for fear of spoiling the surface. Click on the images below to see the work in various stages of progress.